An innovation in the world of tennis: the Tri-tennis®! This new product makes playing tennis and similar sports possible everywhere, and for amateurs and professionals! 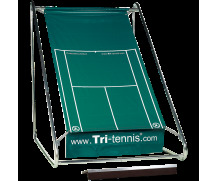 Tri-tennis® is a playing pitch made of weatherproof sailcloth that is attached by springs to a galvanized-steel frame. When you hit a ball against the canvas it always returns with the same speed, irrespective of the speed of the serve, and at just the right distance for your next volley. Upon hitting the ball, Tri-tennis® gives you sufficient time to prepare for the next stroke. 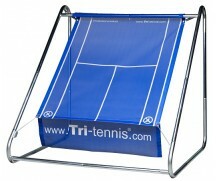 The Tri-tennis® is suitable for various playing styles and even for a variety of sports. It can be set up on every kind of surface and in all weathers. It is also ideal for all ages and abilities, making it a really handy device for tennis trainers. 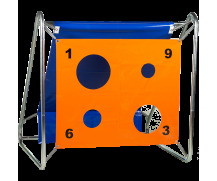 In addition, the Tri-tennis® is suitable for children just beginning with tennis because it is possible for several children to play at the same time. Tri-tennis® is a perfect product to attract new sponsors for your tennis club or organization. We are able to print the logo / company name of your sponsor on the Tri-tennis® PRO as well as on the Tri-tennis® XL playing-field. For tennis clubs, sports centres and similar facilities we offer attractive opportunities for giving the Tri-tennis® a trial run: for example during an event or tournament week. 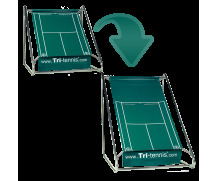 Do you want to try the Tri-tennis® or you want more information about the Tri-tennis®? Contact us now! • Schools; without guidance, more children can play simultaneously. Tri-tennis®, also your ideal tennis partner! Do you currently have a Tri-tennis® PRO, but would you prefer a Tri-tennis® XL? That's possible! You can easily extend your current PRO model to the new XL model with the Tri-tennis® extension kit. 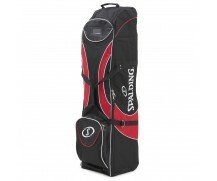 Existing customers can buy a extension kit to change their current PRO model into the enhanced XL model. 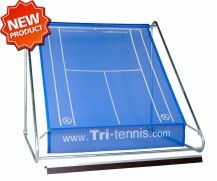 Tri-tennis® XL can be supplied with a “fun-sailcloth”. This is a colored sailcloth with numbered and different sized holes, which can be attached on the back of the Tri-tennis® XL. This is an amusing expansion to play football or to use for training purposes. Is the canvas of your Tri-tennis® not tightly enough stretched anymore in the metal frame and can't you make no optimal use anymore of your Tri-tennis® product? 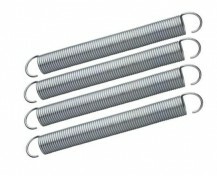 Buy the original Tri-tennis® metal springs (4 pieces) of stainless steel to be able to play again on your Tri-tennis®! 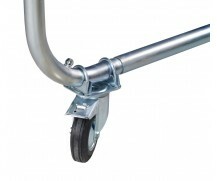 It's easier to move your Tri-tennis® with our deluxe wheels (incl. brakes)! Travel trolley for easy transportation of your Tri-tennis® products. Suitable for both the Tri-tennis® PRO as the Tri-tennis® XL.